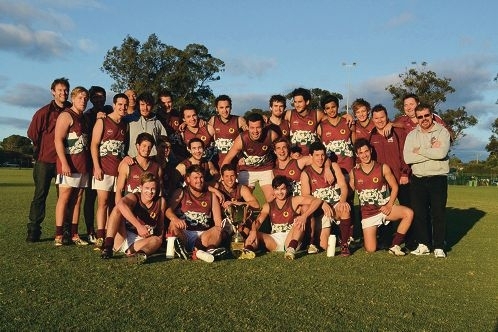 WAAFL derby champions the Carlisle Cougars. Despite a rough month for the Cougars, the team battled windy conditions at Forster Park on Saturday, July 20, to take the lead in the second half of the match, eventually winning 21.11 (137) to Belmont’s 4.4 (28). It was a tough blow for Belmont who lost by 90 points to Carlisle in May in the first contending match for the Cup in several years. Carlisle captain Bayden Drew was absent from the playing field after he was taken off in the first few minutes with a suspected knee injury. Coach Danny Ferguson said he did not know if Drew’s injury would prevent him from playing in the remainder of the season. ‘He had a bit of a knee issue in the warm up and we sort of thought it was going to be OK but after the first couple of minutes he discovered it wasn’t going to be a good day for him’ Ferguson said. Ferguson said the team was looking forward to a few tough matches over coming weeks and he expected them be close to full strength come finals time.